The cardboard box had two-ply walls, beveled corners, and eight 1-inch copper staples sealing it shut. It was a little larger than a casserole dish and twice as deep. You needed a flathead screwdriver to pry open the staples. Inside the box nestled nine heirloom Cornice pears, each wrapped in tissue paper, each slightly smaller than a softball, and each so juicy I ate one after another with a towel under my chin. Regardless of the hype that heralded the holidays, the arrival of a fruit-filled box every year symbolized the start of the Christmas season for me. The box usually came in the mail one week before time to unwrap presents. And the boxes came and came over the decades. The tradition of mail-order pears for Christmas began with my mother. She co-opted the idea from my grandmother, who enjoyed giving homegrown fruit and homemade cookies as holiday gifts. My mother’s culinary prowess, though formidable, tilted toward utilitarian. She preferred to cook meals, not gifts. 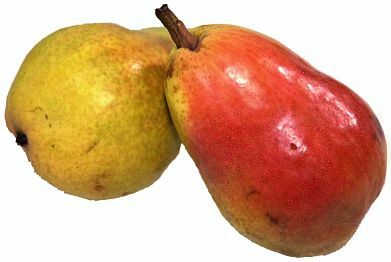 Around the mid-1970s, my mother discovered Harry & David, an Oregon-based fruit grower with a knack for customized distribution and a reputation for incomparable pears. Mail-order fruit was not a novelty in my parents’ house, but only the pears made a lasting impression. Occasionally, yellow-skinned Bartletts or green Anjous filled the Christmas box; however, the Cornice variety with its mottled skin and rich, earthy aroma became exclusive to the tradition. Each box was impressive, too. Each lasted well past the shelf life of the memories it served. The boxes became bins for books, baked goods, and knickknacks. They faded before they failed, and resisted drips and spills. I recall my father once finding a stack of Harry & David boxes warped by a pipe leak in a crawl space, yet their contents remained unblemished. Six pear boxes were what I used to pack the sum of my life when I left for college. Four of those boxes survived nine moves and five job changes. At some point, the holiday fruit shipments turned automatic, surprising even my mother at times. After I left home for college, separate shipments followed me. They trickled into the corners of the country where I lived. I missed many Christmases away from my parents, yet the seasonal appearance of the pear boxes remained a touchstone to that holiday joy of my youth. Last year, a box arrived while my mother was still in the hospital. The last batch of Cornices was as juicy as I ever remembered. My mother had no memory of sending them, no memory of even tasting them. Her own box went unopened. She had forgotten about them entirely, though Harry & David had not. Last summer, after she died, I was tasked with settling her affairs. Among them was her Harry & David account. I thought about shifting the main shipping address to my own and continuing the tradition. Then I thought back to all the times she called to ask if the box of pears made it in time for Christmas, and how relieved she sounded when I said yes. The pears were her comfort food — she was comforted in knowing they reached their destination and that they, more than any other gift, would be appreciated. The pears served their purpose. The boxes, remarkably, still serve others. Thanks for sharing the tradition with us. They arrived on time, as you know, and we will be enjoying them soon.